Ahhhh, spring. Beautiful blossoms and fresh April showers signal warmer days ahead. Even though we are still having cool days and nights; now is the time to get ready for the upcoming cooling season. Will your A/C be ready to cool things down when the sun begins to shine? Here are some energy-saving tips to get your home comfort system ready for the season. Simple maintenance: After clearing leaves, brush, and dirt from inside your air conditioner’s top grille, trim nearby shrubs and bushes to allow at least two feet of clearance around the unit. Any number of things can damage the fins of the A/C condenser fin coils, including hail, which makes the condenser fin coil inefficient. This restricts airflow through the fins of the condenser coil to cool the refrigerant in your unit, which causes the unit to work harder. This wastes energy, costing you more money. Ideally, you should replace your air conditioner filter once a month, because dirty filters restrict airflow and mean your system is wasting energy, but depending on your usage at least check your filter once a month to determine if it needs replacement. Replace your air filters at a minimum of four times a year (quarterly). Better now than later: Even if it isn’t a very warm day, go ahead and set your thermostat to cooling mode now and run your air conditioner a few minutes to make sure it’s working. If you wait until the weather gets hot to find out your air conditioner isn’t operating the way it should, it may be days before a technician is available to fix it. Scheduling an annual checkup or “tune-up” with an HVAC mechanic in early spring can also help you identify any small problems that could turn into large problems later. Go green, save green: If you’re planning to replace your air conditioner, look for an Energy Star qualified model. 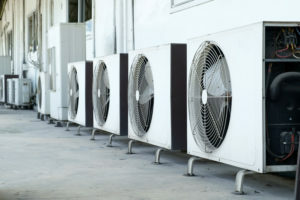 Replacing an old, inefficient central air conditioner with a high-efficiency system can reduce cooling costs up to 20 percent. If you use a room air conditioner, install it on a north-facing wall to keep it out of the sun. Room air conditioners work better when the unit stays cool. Turn off lights you don’t need to save energy and reduce extra heat. Prepare dinner on your outdoor grill to keep the heat outside to help reduce your air conditioner’s load. Use drapes or blinds on your windows to keep out the suns radiated heat. Using ceiling fans inside can help circulate air to keep you feeling cooler so that you can set your temperature up inside to reduce A/C loads. In summer, Counterclockwise speeds create a wind chill factor for a cooler environment.